Khachapuri is a cheese pie filling is a native of Georgia. The popularity of this dish has long gone beyond the edges of the Caucasus. This is not surprising. Because there are so many ways of cooking khachapuri, this applies to both the doughand the filling. Everyone can find a place according to your taste. 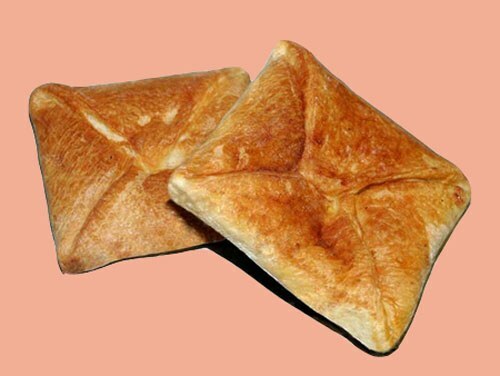 There are open and closed khachapuri, a leavened and unleavened doughwith different kinds of cheese, greens, baked in the oven and pan-fried, round and square. One of the most common types of khachapuri, made of flaky doughwith a salty cheese and greens. Pour the sifted flour in a large, deep bowl. Pour in the flour water at room temperature. Add one egg and half a teaspoon of soda, slaked vinegar. Knead very stiff dough. If necessary, add more flour. Fold the dough in four, roll out thus to make a rectangle about the size of 2/3 of the initial layer. Fold in four and place in refrigerator for one hour. Remove the dough from the refrigerator after one hour, roll the pastry out wide as a finger. Again roll four times and place in the fridge for half an hour. Repeat the procedure two times. Put cheese or cheese in a Cup and thoroughly mash with a fork. If the cheese is highly elastic, grate it on a fine grater. Add cheese in the egg, pour in the melted butter and mix. Chop the greens and add the cheese mass. Salt the stuffing is not necessary, you can optionally add some pepper. Roll out the dough, divide it into squares the size of half a notebook sheet. In the middle of each square carefully put the stuffing and spread on the surface of a thin layer of smooth, not forgetting to indent the edges of 2-3 cm. Zasypaete edges so that they were shaped like envelopes. Gently push khachapuri with his hands, trying not to break form. Grease a baking sheet with vegetable oil, carefully put the khachapuri at a distance of 2-3 cm from each other. Place baking sheet in a preheated 200 degree oven. Bake the khachapuri for 15 to 20 minutes. Once they become a Golden color, they can be removed from the oven. The finished product is brush with a thin layer of melted butter. Serve with hot sweet tea. When cooking the filling, ensure that the weight is not too liquid. Don't forget to leave one or two tablespoons butter for greasing the finished products.